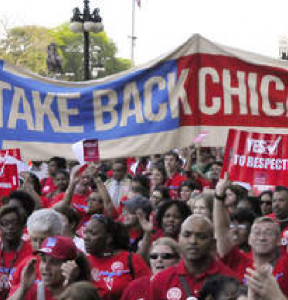 CHICAGO—The mayor and his handpicked Chicago Board of Education continue to send mixed messages regarding the future of Chicago’s public schools. The week began with the layoff of nearly 1,000 educators, yet 500 vacant positions, and ends with budget talk that again relies on phantom money from both the city and state—at a time when Gov. Bruce Rauner has issued an amendatory veto of Senate Bill 1, reducing funding for school districts across Illinois. While the mayor devises taxes, fines and fees to squeeze revenue from working families struggling to recover from the Great Recession, he has let Chicago Public Schools (CPS) slide into financial disaster. The figures introduced in today’s 2017-2018 CPS operating budget “framework” remain insufficient, and the Chicago City Council will be voting on inadequate funds to cover previous budget cuts weathered by parents, students and educators, and not any additional resources for our schools. CPS needs to fill a $1 billion structural deficit. Balancing the budget on the backs of our students and school staff is unacceptable. The mayor’s offering—$200 per student compared to the $2,700 each student needs—is not enough, but had he made this effort in 2013, our district wouldn’t need payday loans at interest rates that cost taxpayers $70,000 a day. He could have renegotiated toxic interest rate swap deals and saved the district millions; instead, he paid 100 cents on the dollar to banks with borrowed money, driving up debt costs and resulting in massive cuts to our classrooms and communities. The latest transgression, the governor’s voucher program, is a giveaway to Illinois’ wealthiest residents and an economic drain on state and school district budgets. Rather than stay silent about this attack on public education, the mayor should instead throw his full weight behind a LaSalle Street Tax, millionaires’ tax and graduated income tax on the state’s highest earners—including his own donors—which puts real money into public education and addresses the pressing needs of our school communities. 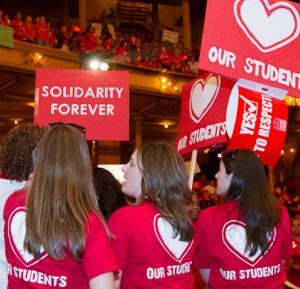 CPS has laid off hundreds of teachers and paraprofessionals every year. This summer, layoffs have been particularly hard on the communities of Brighton Park, Austin, Gage Park, Back of the Yards and Bronzeville. Like in past years, layoffs have disproportionately affected teachers and staff of color. Average class sizes have been climbing for years. In 2015, CPS had the distinction of being in the top 94th percentile for the average kindergarten class size across the entire state of Illinois, and above the 90th percentile for other early grades. Last year, more than a third of CPS classrooms in the K-2 years had more than 29 students. Since 2013, social workers have plummeted from 378 to roughly 300, a decline of 18 percent. Like other clinicians, social workers also service students across many CPS charter schools, spreading insufficient resources even thinner. CPS paraprofessionals have borne the burden of numerous cuts. Since 2011, the number of CTU paraprofessionals has dropped from 4,300 to fewer than 3400, a decline of 21 percent. Vital positions also have been lost. For example, Guidance Counselor Assistants have declined by 28 percent, despite the fact that school counselors are now more over-burdened than ever. The mayor promised a better school day, but the temporary supports for arts and music in 2012 are now gone. Since 2015, music is down by 15 percent and the arts by 12 percent. School librarians have been decimated. Just 160 librarians were budgeted for 2017, compared to 454 in 2012.